When we last saw our long-sleeved tee, I had just ripped out the intarsia section because I had somehow created a pucker underneath the "o". I'm glad I redid it -- seems like with intarsia, the fifth time is the charm! After a fair amount of math and sketching, I knit the sleeves. They seemed to knit up very fast, but that could just be the Calmer talking. When I slipped it on to check the sleeves, I noticed something surprising. I really liked the shape of the neck, which was still collar-less, exactly as it was. I decided that since Rachel and I had taken out so many of the original "tee-like" elements already, leaving off the ringer collar wasn't too much of a stretch. 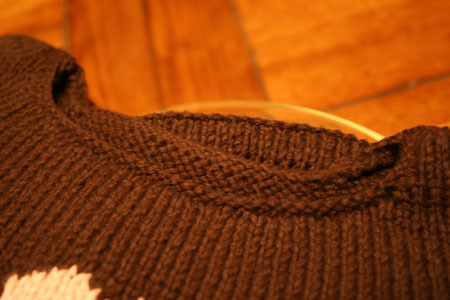 So instead, I just picked up stitches and bound them off purlwise to give the neck a finished look. Voila! I brought the shirt with me to New York last weekend to give to Rachel. She slipped it on right away, and looked at herself in the mirror: "'Mommy'. That's me! ", she said. As soon as those words left her mouth, Syd started yelling from the next room -- and since Syd had been projectile vomiting just a half hour before, Rachel wisely slipped the tee off before going to fetch her. In other words, so perfect is this shirt for Rachel that there wasn't even time to take a picture of her in it! I would love to see a picture of Rachel in it. The NBaT is so cute and Mommy, how sweet it that! I am loving the tee. 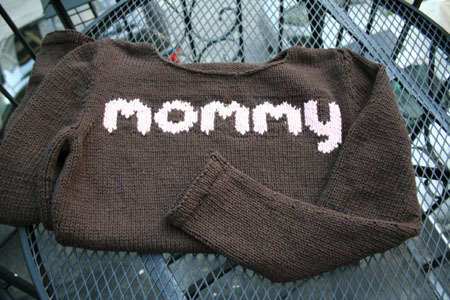 did you use the nothing but a tee shirt pattern from alison? I would love to make one for me. Beautiful intarsia. Looks like I need to practice. Leslie, I did use Alison's pattern -- though obviously, we did make some changes (long sleeves, no contrasting edging, no collar). The body is 100% NBaT, though! I love the "Mommy". Awesome!!! How in the world did you get the collar stitches so even? It is a beautiful t.